Defense secretary-designate Chuck Hagel favors amending the defeated Comprehensive Nuclear Test Ban Treaty (CTBT) that was rejected by the Senate in 1999 as unverifiable and against United States security interests. According to a "dear colleague" letter sent to senators shortly after the treaty’s defeat, Hagel, who voted with Republicans in opposing ratification, stated that he strongly believed the treaty was not dead, and urged senators to begin work on a "verifiable nuclear test ban." "We can work together to determine what changes need to be made to the treaty, including conditions and reservations, to allow it to be passed by the Senate," Hagel stated in the Nov. 5, 1999 letter cosigned with then-Democratic Connecticut Sen. Joseph Lieberman. The Washington Free Beacon obtained a copy of the letter. Hagel’s support for sharp nuclear arms cuts and other arms control issues like the test ban treaty are expected to come up during questioning by skeptical Republicans during his Senate nomination hearing set for Thursday. The Obama administration over the past two years quietly has sought to promote a second Senate vote on the test ban treaty. Treaty supporters withdrew the pact following the 1999 ratification vote in a procedural move that prevented it from being formally killed. An administration official working with Hagel confirmed that the former senator supports the administration's position of working to ratify the Comprehensive Test Ban Treaty. The administration official declined to say what specific changes Hagel wants to make to the CTBT that would fix the agreement. An interagency intelligence assessment of the CTBT disclosed by the Free Beacon in March concluded that verifying the ban on nuclear tests is difficult and that verification problems with the treaty remain unresolved since the treaty was rejected in 1999. The 2010 National Intelligence Estimate (NIE) outlined numerous problems with verifying whether a country conducts a nuclear test, said U.S. officials familiar with the NIE. The intelligence assessment was disclosed shortly before a more optimistic study was made public in April by the National Academy of Sciences (NAS). The academy study concluded that monitoring could adequately detect nuclear tests around the world, and that U.S. nuclear forces can be maintained without testing. John Kerry, who was confirmed 94-3 to serve as Secretary of State on Tuesday, also supports holding a second Senate ratification vote on the CTBT. The CTBT bans all nuclear test explosions. It was adopted by the United Nations General Assembly in 1996 and was signed by 183 states and ratified by 157. Verifying underground nuclear tests remains difficult despite advanced U.S. intelligence sensors and technology. For example, it was difficult to determine with high confidence if the 2009 underground blast in North Korea was a nuclear or conventional explosion. A former senior Senate aide close to the issue said the 1999 letter shows Hagel "clearly wanted to design future conditions under which the Senate could consider the CTBT." "As a signatory to the Global Zero report, he apparently believes no changes are needed to the treaty, since no nuclear weapons are needed, or, at a minimum, that we will need very few of them," the former aide said. "In either case, a CTBT has profound implications for a small nuclear force." Nuclear deterrence experts argue that any steep cuts in U.S. nuclear forces, as envisioned by the Obama administration’s Nuclear Posture Review implementation study, would sharply increase the risk of imposing a complete ban on nuclear testing. The United States currently observes a self-imposed moratorium on nuclear testing that could be reversed if the nuclear stockpile cannot be maintained with underground tests. Hagel publicly signed an anti-nuclear weapons Global Zero statement that calls for the complete elimination of all nuclear weapons and an international agreement to do so by a certain date. However, in recent meetings with Republican senators, Hagel has backed away from his more radical anti-nuclear positions, claiming he supports President Barack Obama’s call for the elimination of all nuclear arms—but only after other nations and nuclear threats are no longer present. Hagel has claimed in the meetings that the anti-nuclear weapons positions advocated in a Global Zero report he took part in writing were the brainchild of retired Marine Corps Gen. James Cartwright, a former vice chairman of the Joint Chiefs of Staff. That position is contradicted by an interview Hagel gave in a 2009 with al Jazeera in which he said eliminating all nuclear weapons will take time and will be difficult but must be attempted. 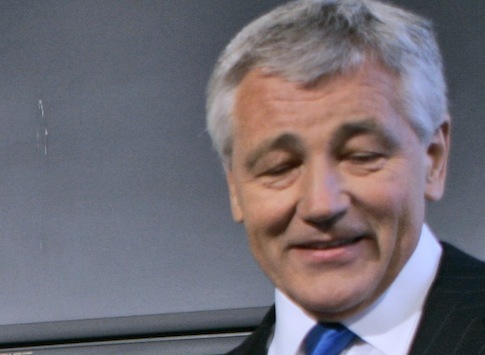 Critics of Sen. Hagel provided the March 31, 2009 video to the Free Beacon. Hagel reveals in the interview that the goal of eliminating nuclear arms was more than an aspirational goal and that a concrete program was underway. Asked how such nuclear arms elimination could be verified, Hagel said experts were working on a "verifiable protocol" that was to be presented the following year. Hagel said nuclear disarmament must begin with the United States and Russia and noted he has discussed eliminating nuclear arms during a meeting with then-Russian President Dmitri Medvedev. Hagel said Medvedev, like Obama, favors eliminating nuclear arms. "And I believe that President Medvedev as well as President Obama are serious about this," Hagel said. Hagel acknowledged that nuclear weapons had maintained the peace during the Cold War but now were outdated. "There can be only one outcome if we don’t get control of this," he said. "Because that means if we don’t get control, the world will proliferate with these nuclear weapons, the technology to build them, the ability to build. And at some point something will happen. What we want to do is stop that from, that occurrence." This entry was posted in National Security and tagged Chuck Hagel, Nuclear Weapons, Obama Administration. Bookmark the permalink.